I've seen this whimsical and wonderful show three times over the years and it's as charming as ever. Mermaid Theatre of Nova Scotia is world renowned and their shows leave a lasting impression. I took my kids to see this show when they were toddlers, and the production was playing Bookamania at the Harold Washington library. We later caught them again in partnership with Chicago Children's Theatre. These vibrant puppets bring Eric Carle's treasured books to life in a delightful way that's sure to charm children and parents alike. Highly recommended! Click here to check out our past Brown Bear coverage (including our wacky story involving tattoos and toddlers who just can't wait to pee). 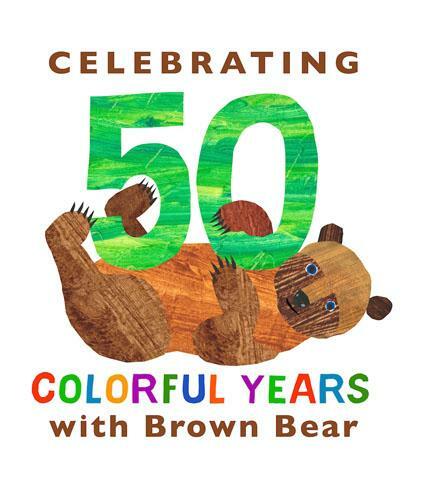 Celebrating the bedside book's fiftieth anniversary, Brown Bear, Brown Bear has introduced countless toddlers to the delights of identifying colors and objects. Now many of Carle's current generation of fans, children ages 1 to 5, will make their very first trip to a live theater to see their favorite Carle characters come to life before their eyes through the magic of puppetry, live on stage. 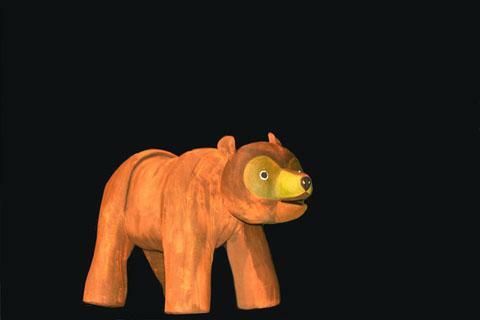 Brown Bear, Brown Bear is an hour-long production that showcases the imaginative blend of innovative puppetry and striking scenic effects that has won international acclaim for Nova Scotia's Mermaid Theatre. 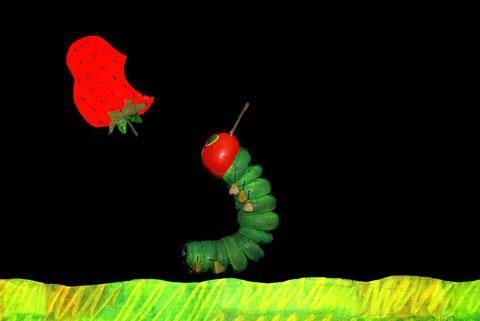 In addition to the title story, Brown Bear, Brown Bear also boasts the all-time Carle classic, The Very Hungry Caterpillar. 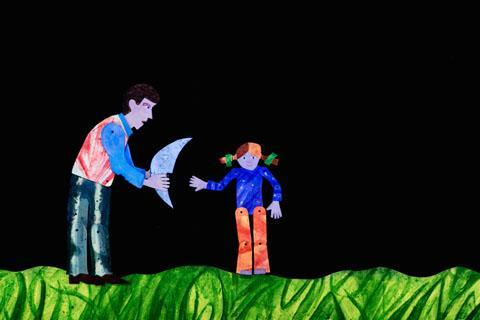 Completing the trilogy is the heartwarming father-daughter tale Papa, Please Get the Moon For Me, a splendid introduction to the wonderment of the lunar cycle. 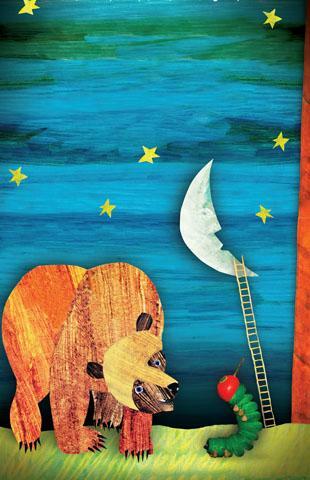 When Chicago Children's Theatre last invited Mermaid Theater to the Windy City, Time Out Chicago raved Brown Bear, Brown Bear provided "sweet-as-can-be doses of narrated fantasy, made more so by a whimsical score. Even kids unfamiliar with Carle's canon remain rapt, thanks in large part to the dramatic lighting, those glowing sets and the handiwork of (just) two puppeteers." Best of all, when the show's over, Mermaid Theater's puppeteers reveal all of their super stagecraft secrets to satisfy the "how did they do that?" curiosity of children (and parents) in the audience. 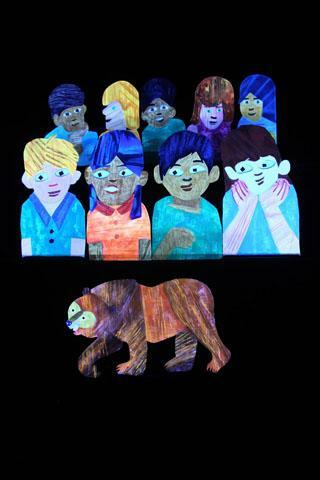 Brown bear sightings in Chicago are rare, so don't miss Brown Bear, Brown Bear & Other Treasured Stories by Eric Carle, based on the stories by Bill Martin Jr. and Eric Carle. 1016 N. Dearborn St., Chicago. Show times are Tuesdays through Friday at 10 a.m., Saturdays at 9:30 a.m. and 11:30 p.m. and 3 p.m., and Sundays and 11 a.m. and 3 p.m. Single tickets are $10-$39. For tickets and information, visit chicagochildrenstheatre.org or call (872) 222-9555. Email groupsales@chicagochildrenstheatre.org or call (773) 227-0180 x 321 to learn about discounted group rates for schools, playgroups, birthday parties and scouting groups. The Ruth Page Center for the Arts is convenient to public transportation, surrounded by restaurants and located just steps from the Magnificent Mile. Saturday, May 20 at 9:30 a.m. and 11 a.m.; Sunday, May 21 at 11 a.m. and 3 p.m.
Sunday, May 21 at 11 a.m.
For more about access services, go to chicagochildrenstheatre.org/access or contact Access and Inclusion Manager Alex Mauney at cmauney@chicagochildrenstheatre.org. While culminating its final mainstage season at the Ruth Page, CCT has transformed the former 12th District Police Station at 100 S. Racine Avenue in Chicago's West Loop into its first permanent home. The new Chicago Children's Theatre, The Station, is a beautiful, mixed-use performing arts and education facility designed to serve all Chicago families. The critically acclaimed world premiere of The Magic City, an all-ages show created by Chicago's Manual Cinema, inaugurated the building's new 149-seat Pritzker Family Studio Theatre, followed by a new staging of Pinocchio with Chicago's Neverbird Project featuring young hearing and Deaf actors, April 20-May 14. Tickets to Pinocchio are $25. For tickets, visit chicagochildrenstheatre.org or call (872) 222-9555. With five brand new classrooms devoted to performing arts instruction, education is at the heart of Chicago Children's Theatre's new home. Registration is now open for a diverse roster of classes and camps for toddlers to teens in theater, storytelling, modern movement, film making, hip hop, craft and aerial circus arts. Learn more at chicagochildrenstheatre.com/education. Scholarship and tuition assistance is available. Additionally, CCT now has its own dedicated space at The Station for Red Kite programming for children with autism and other special needs. This spring, children will participate in a new Red Kite Adventure, a multi-sensory theatrical experience tailored to the unique needs of each child who attends. The Station will also be home to Camp Red Kite, the only summer arts camp of its kind in Chicago for children on the autism spectrum. Learn more at chicagochildrenstheatre.com/red-kite-project. Since its launch in 2005, Chicago Children's Theatre has cemented its reputation as the city's largest professional theater company devoted exclusively to children and young families. The company evolved out of Chicago's need for high-quality, professional year-round children's programming to match the quality and significance of theatrical powerhouses such as Steppenwolf Theatre Company, Goodman Theatre and Lookingglass Theatre. Likewise, CCT has always believed children should be treated as the sophisticated audiences that they are with high-profile and award-winning talent, inventive production values and compelling stories that challenge, educate and entertain. Audiences have embraced Chicago Children's Theatre since its inaugural production, A Year with Frog and Toad, at the Goodman Theatre in 2006. Since then, the company's productions have featured everything from black-light scenery to live music to interactive four-dimensional sets to life-size puppets, with performances showcasing the heart of Motown to Vaudeville to contemporary, current and modern styles. CCT has also built a national reputation due to its strong focus on new work, producing 15 world premieres in the last 11 years including The Selfish Giant, The Hundred Dresses, Jackie and Me, Dot and Ziggy, The Houdini Box, The Elephant and The Whale (in association with Redmoon), Mr. Chickee's Funny Money, Leo Lionni's Frederick, Wonderland, Alice's Rock & Roll Adventure, A Snowy Day with Beatrix Potter, Jabari Dreams of Freedom, Another Snowy Day with Beatrix Potter, The Magic City and The Year I Didn't Go To School: A Homemade Circus. These enjoyed highly successful inaugural runs in Chicago, followed by new productions at family theaters across the U.S.
CCT has always honored a strong commitment to low-income families and children with special needs. In partnership with Chicago Public Schools, the company offers free tickets to more than 5,000 Chicago-area low-income students each season. Led by Artistic Director Jacqueline Russell, Board Chair Todd Leland and Community Programs Artistic Director Frank Maugeri, Chicago Children's Theatre is supported by a dynamic Board of Directors comprised of dedicated individuals from the fields of entertainment, philanthropy and business. Officers include Jeff Hughes, President; Lynn Lockwood Murphy, Vice Chair and Secretary; David Saltiel, Vice Chair; and David Chung, Treasurer. Chicago Children's Theatre is sponsored in part by ComEd and Goldman Sachs Gives. For more information visit chicagochildrenstheatre.org, or call (773) 227-0180.